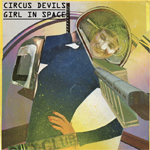 Original Release Notes: Exclusive A-side track "Girl in Space" backed with "Sunflower Wildman" from Circus Devils Stomping Grounds full length. Edition of 500 total. Posted on the CircusDevils.net website in early summer 2015: ATTENTION! AVISO! ACHTUNG!